You might have heard that Mac OS X Lion ditches Front Row, the easily accessible media player that was activated by hitting Command+Escape on a keyboard or by pressing play on an Apple Remote. If you like Front Row and are disappointed in Lion leaving it behind, you can easily get it working again just by copying a couple files over from the prior OS version. If you have Snow Leopard installed and laying around, you can preserve and move these files yourself quickly with Finder or by using cp, just be sure to place them in the exact same locations. This is very easy if you have a dual 10.6 and 10.7 boot config going, but if not don’t worry there’s a simple alternative. 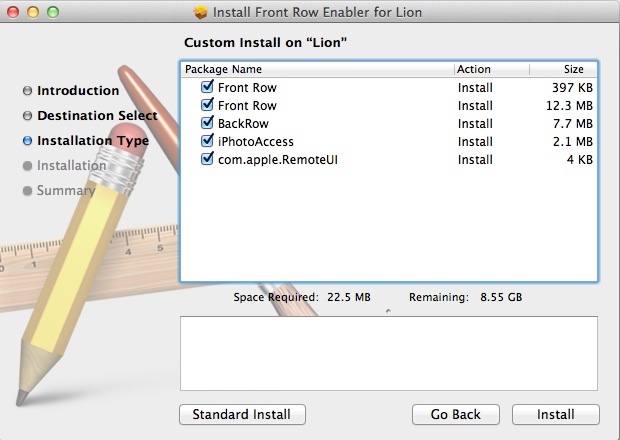 Alternatively to moving the files yourself, you can use use a free package installer that contains the 10.6 Front Row files and places them automatically into the appropriate locations in Lion. This is easier. Download the free package installer by MacHatter. The little package installer app was found by 9to5mac, who goes on to speculate that the ease of enabling Front Row for OS X Lion could indicate that Apple will simply release the application as an optional paid download from the Mac App Store. I like that idea, and I hope it pans out, or else what is the point of Apple selling their Mac remote controls? If you’re looking for a free alternative to Front Row, don’t miss our guide on using Plex to create a Mac media center, it’s powerful, easy to use, and works on any Mac. “With the recent update to iTunes 10.4, Apple has changed how the library is read/written (iTunesAccess.framework). As such, your iTunes Library content will not play in Front Row. The “Plex” much better, its shows the weather to and works with a remote control to! Wow really it shows the weather. With that and the 50 other devices I own. I am sure to always now its 72 and sunny in southern california. how do i install quartz composer? can’t seem find it in installer, and where is the “developer folder”? From there, I can’t remember. I think I opened the MacOS folder and double-clicked on the file in there. It launched Front Row and then everything worked. I think after this, you may need to “bless” the app that way. If anyone else had problems with this, I hope this gets you most of the way there. OK, forget what I said there…. The problem I had is that after I copied the launchagent to a flash drive from the other computer and from the flash drive to my computer, the permissions changed to me as the owner. It needs to be set to Root. I BatchMod-ed it, and it works. Great tip though, guys! I’m so happy to have Front Row again!!!! THANKS for posting this. I was wondering what I had done wrong. Could you explain that a little more to help me to access iTunes 10.4.1 in Front Row? What did you mean BatchMod -ed? Could you provide detailed steps? where do you put the alias for the movies and music to get front row to point to it? Front Row is one of most useless apps on Mac OS X. Personally me, I have never used it…. and in Lion will never miss it. It is not working well. I am unable to access all the functions. I can’t seem to revert this action… Now I have a useless Front Row every time press the “menu” button on my Apple remote. Does not matter that took Apple, Perian is much better because it is show the weather to! But I do not understand why need two chat program? IChat+Facetime? Skype is much better becouse works on every platform! also, why is the ugly chess still part of the system? thay are much better games in app store for free!!!??? I installed Front Row using the installer but I get the message that I need to install files in to iTunes to view in Front Row. How do I get Front Row to see my media files in iTunes? The installer is fantastic, by the way! Under ‘Users’ in MacHD access your iTunes folder. Make an Alias of your ‘Movies’. ‘Drag the Movies alias’ into your general ‘Movies’ folder. Tried making alias of iTunes folder and dragging to movies. It recognises that the files are there, but says it can not play the file format. It’s great to see that people have front row up and running again, great job! Next step, get the tunes going and done! …nad give Apple your feedback. Anyone know how to fix this? Or remove it if I can’t get it working? I installed the package and it works (at least, I can see the trailers). I have not tested yet the Music. Later versions of iTunes, I think past 10.3 or .4 changed how iTunes interacted with Front Row. You have to downgrade but there may be fix, you have to do the work online searching to find it. Copied the files from my Gdrive but when trying to launch Front Row nothing happens. What do you mean by the permissions changed and they need to be set to Root or how to “BatchMod it”? How I get it for OS X 10.8.1 Mountain Lion ? installed the package installer on OX 10.8 and now my Mac will not boot. Very disappointing!